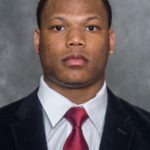 Iowa State All-American running back David Montgomery and three-time All-Big 12 cornerback Brian Peavy were named to the Maxwell Award and Bednarik Award Watch lists, respectively, announced today by the Maxwell Football Club. Since 1937, the Maxwell Award has been given annually to the nation’s best college football player by the Maxwell Football Club. The organization instituted the Bednarik Award for the best defensive player in the nation in 1995. Montgomery will enter his junior year with 1,709 rushing yards, eight 100-yard rushing games, 49 receptions and 425 receiving yards in his career. A senior from Houston, Texas, Peavy enters his final Iowa State campaign as the active team leader in tackles (232), pass breakups (30) and interceptions (5).